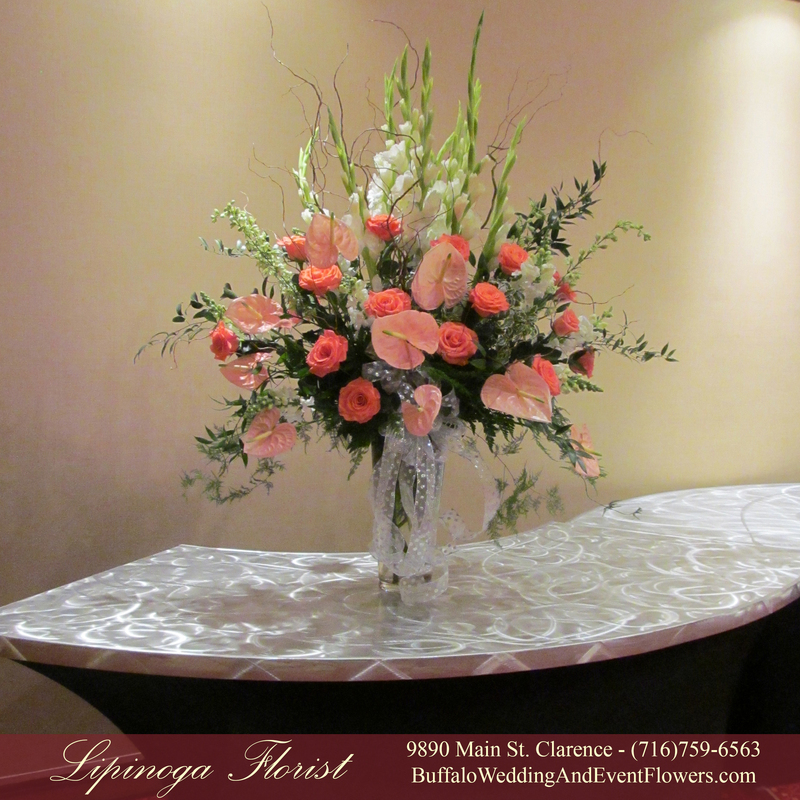 Shades of Coral, Ivory and Soft Peach Blossoms dazzled amongst crystal and silver accents for this wedding held at the Marriott in Amherst, NY. 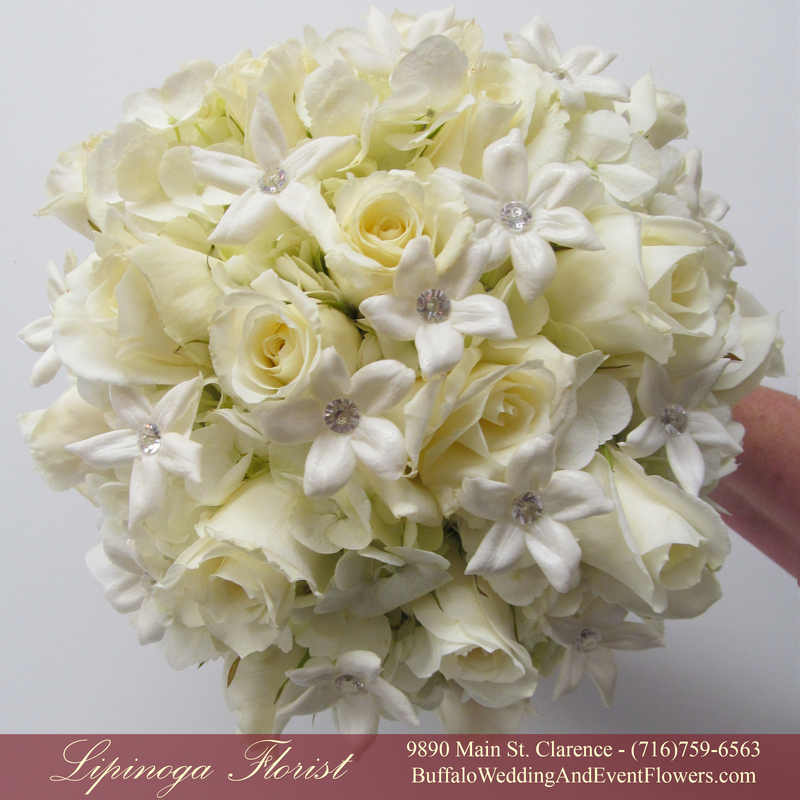 The Bride carried a classic bouquet of white roses, hydrangea and stephanotis with crystal centers for just a touch of sparkle. 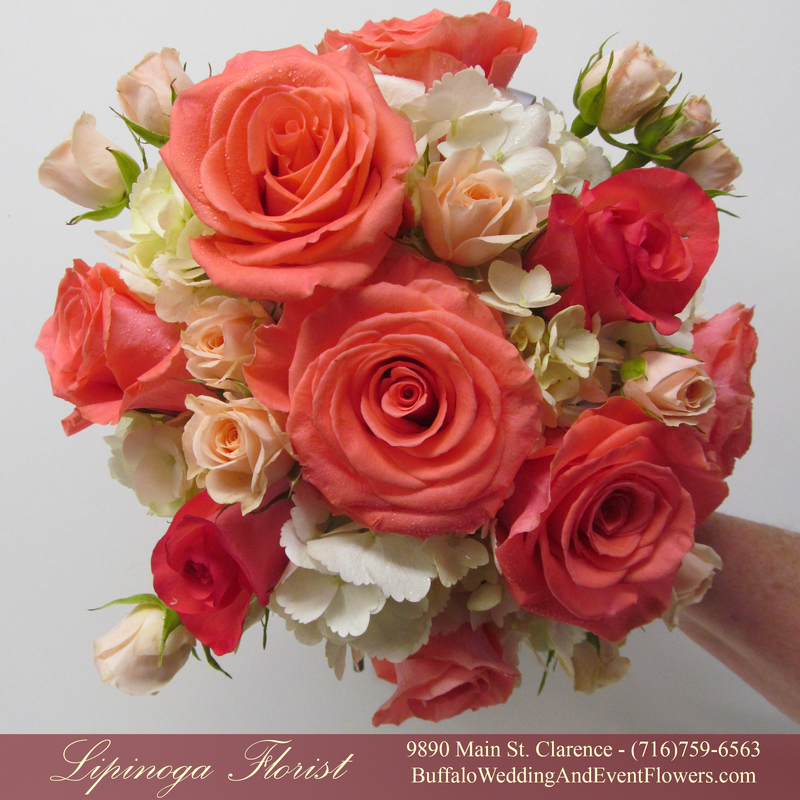 Her bridesmaids carried simple bouquets of hydrangea soft peach spray roses and coral roses. 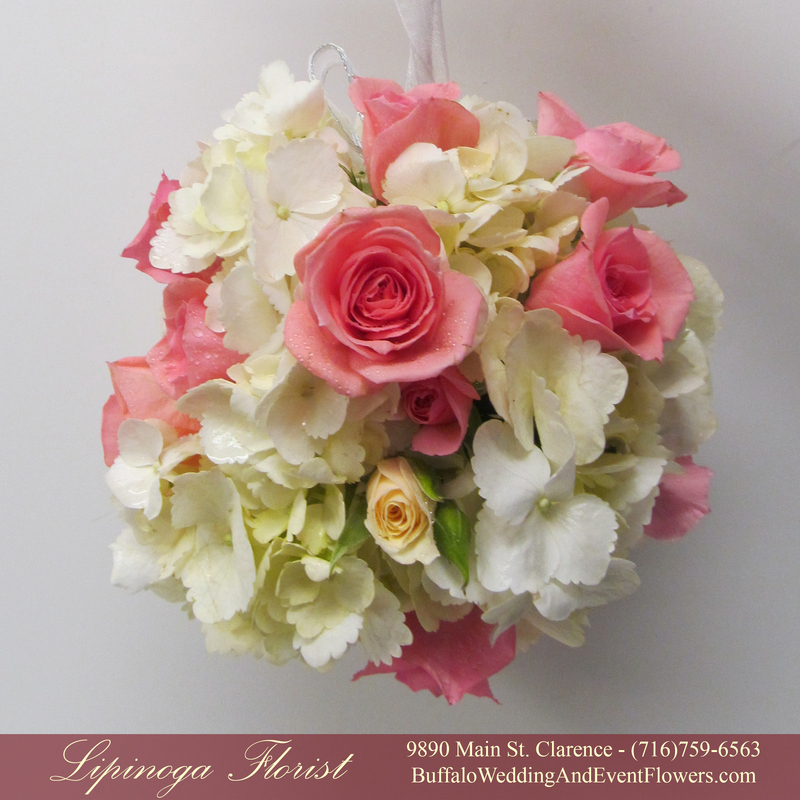 A junior bridesmaid carried a pomander ball of ivory, soft coral and soft peach flowers while, the flower girl carried the same combination in a simple white basket tied with ribbons. 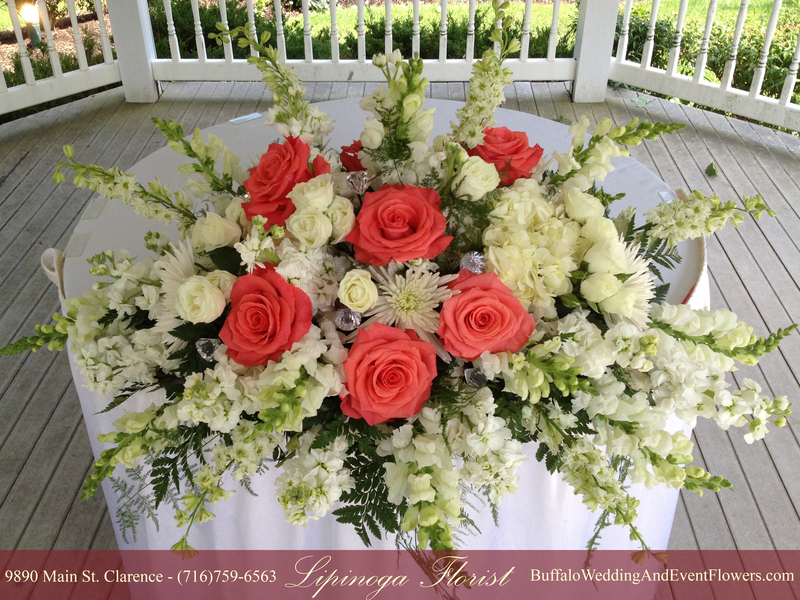 An arrangement of all white flowers with some vibrant coral roses accented by crystals created a focal point for the ceremony. 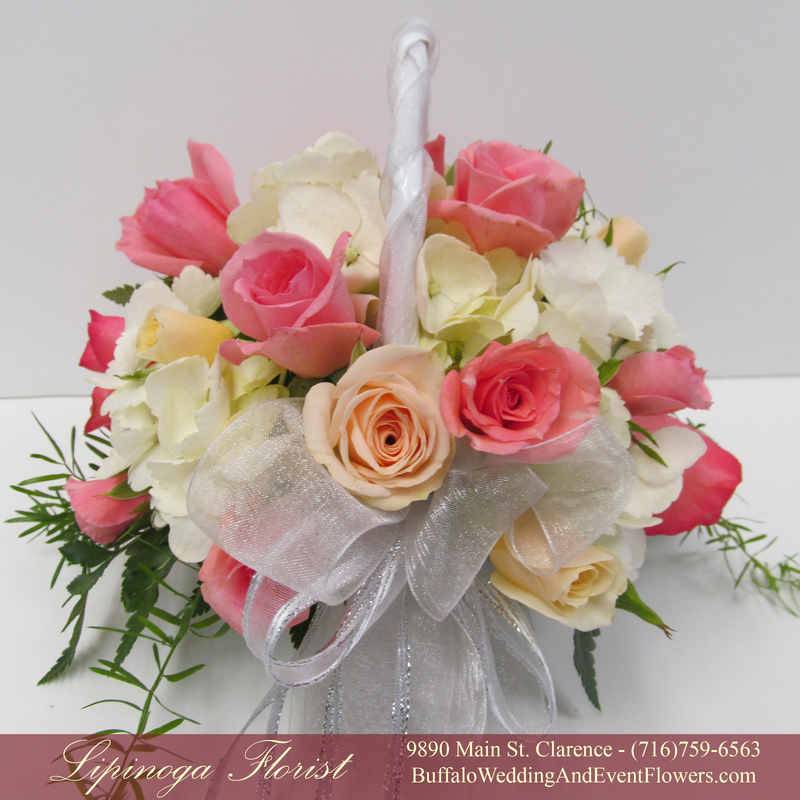 More soft peach was incorporated into the reception where guests were greeted by a large statement arrangement of white, soft peach flowers with pops of coral roses and silver bow. 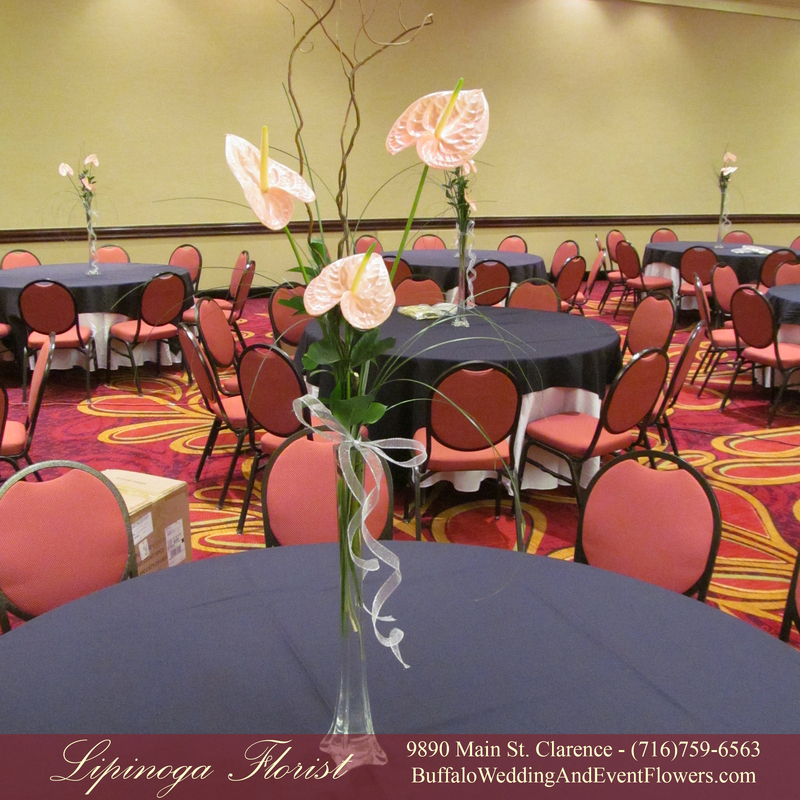 Tall Eiffel tower vases with peach flowers, grasses and branches were tied with a simple silver bow for just a touch of sparkle. 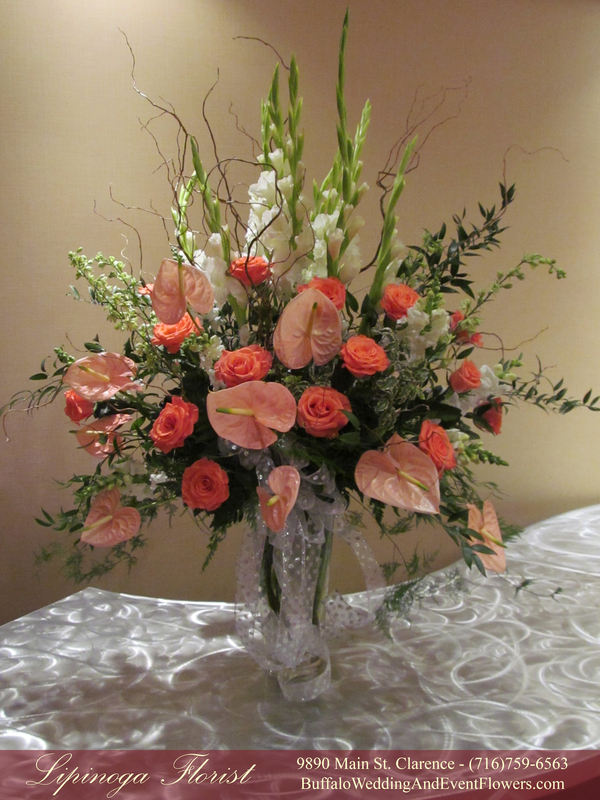 These simple yet dramatic centerpieces designed by the team at Lipinoga’s created a beautiful atmosphere in the Marriott’s main ballroom. 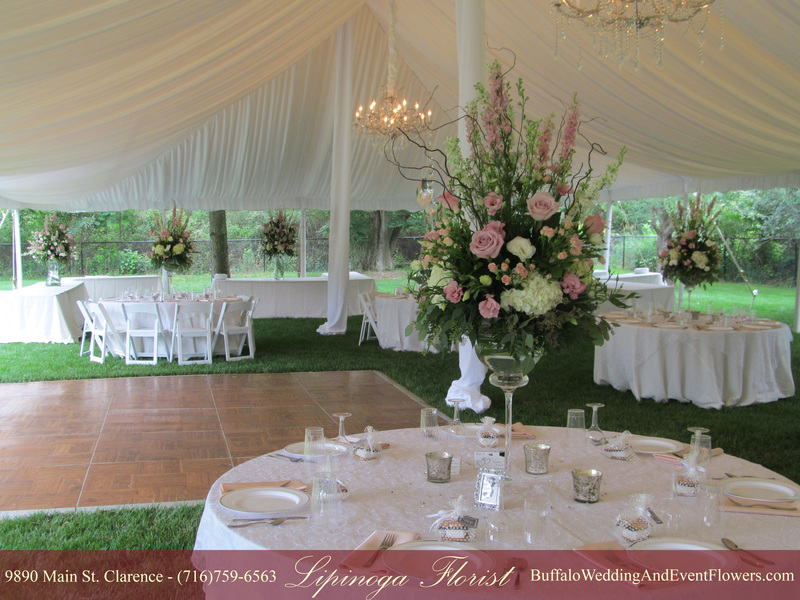 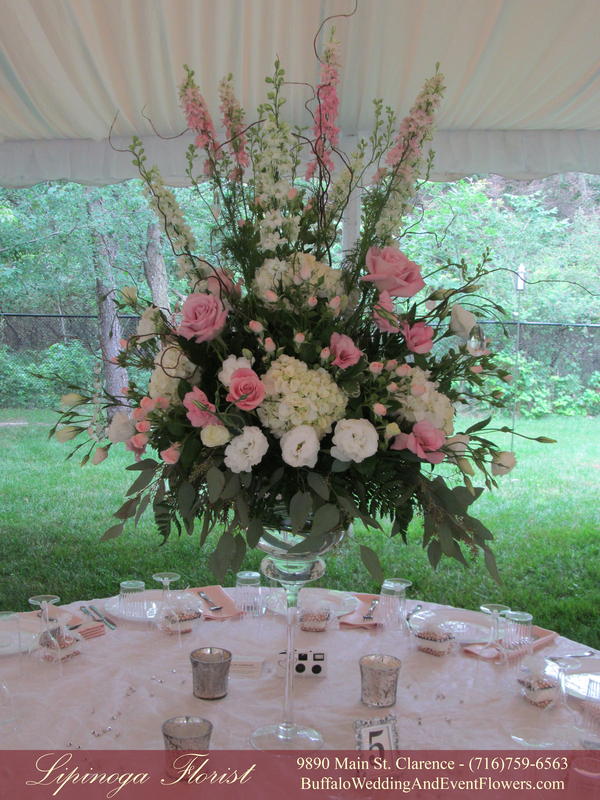 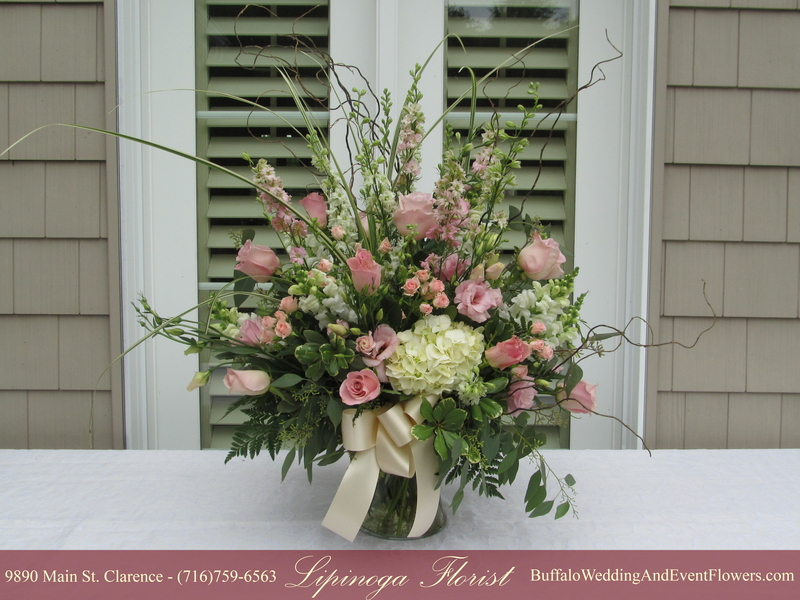 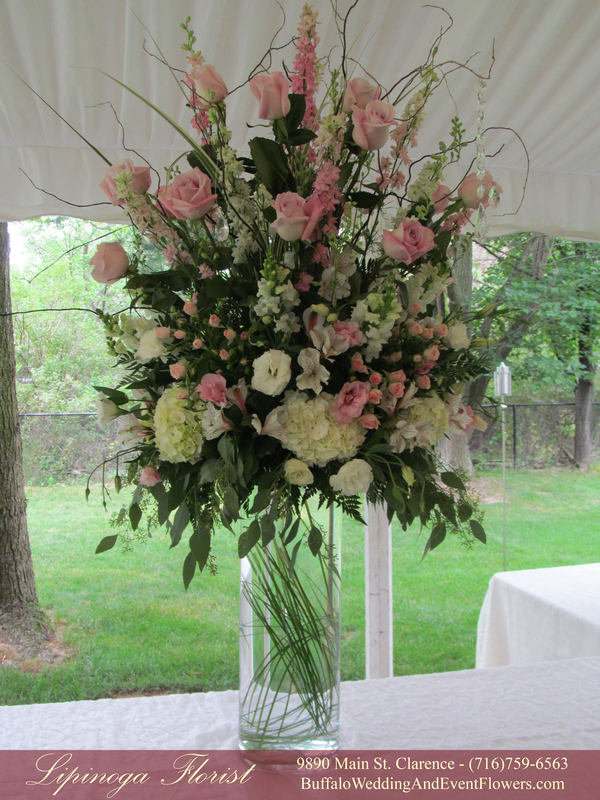 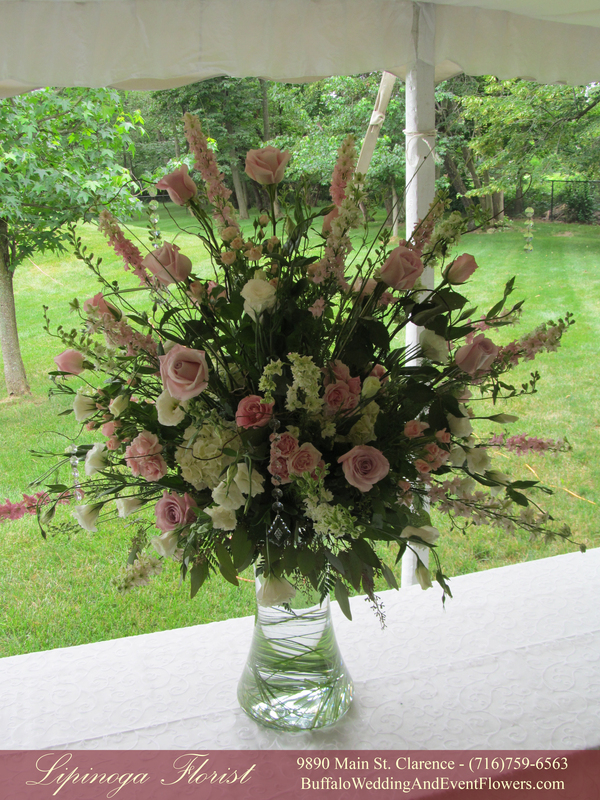 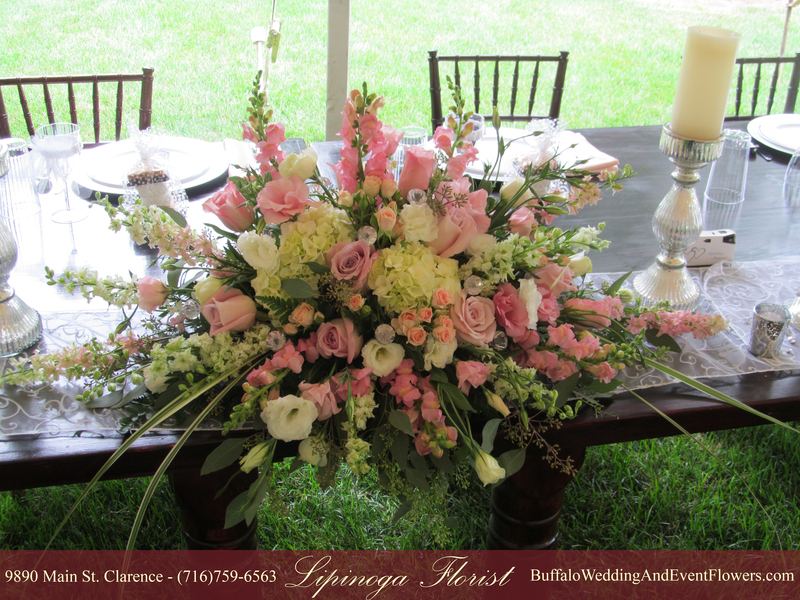 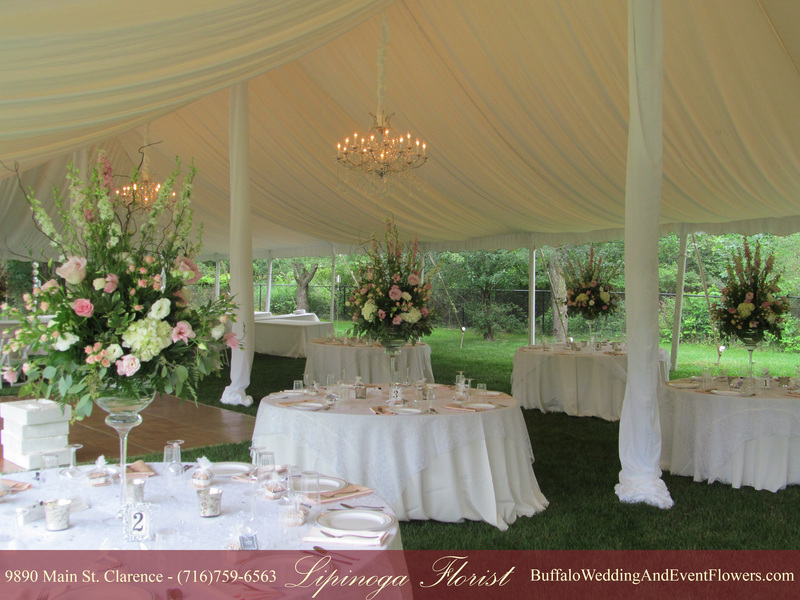 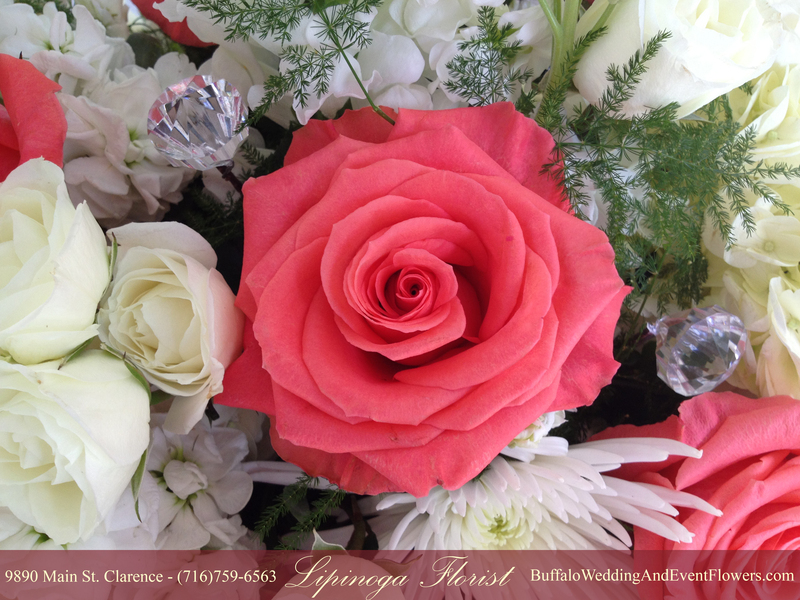 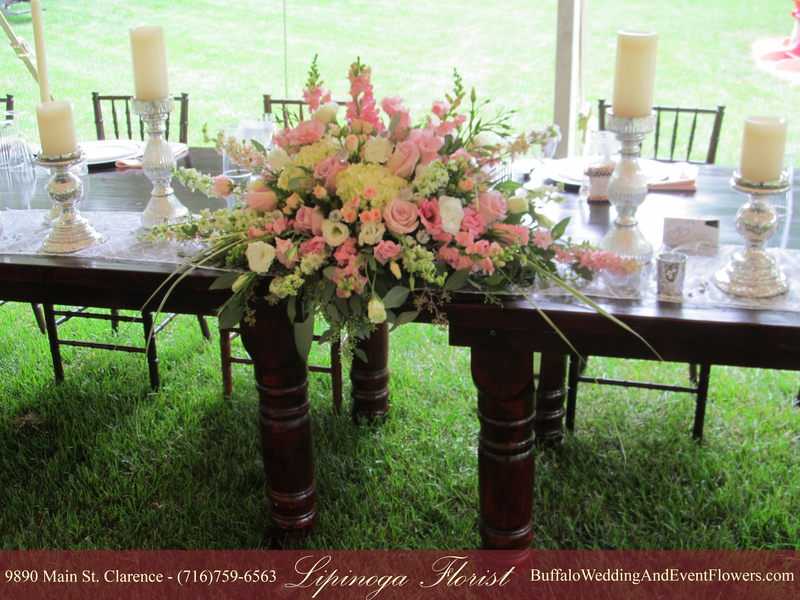 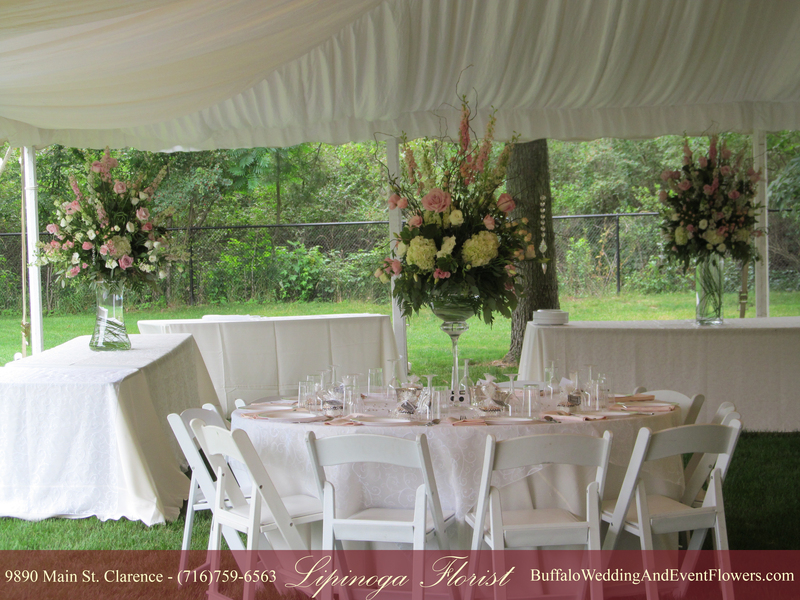 Lipinoga Florist designed flowers for a Tiffany themed wedding with accents of soft pink. 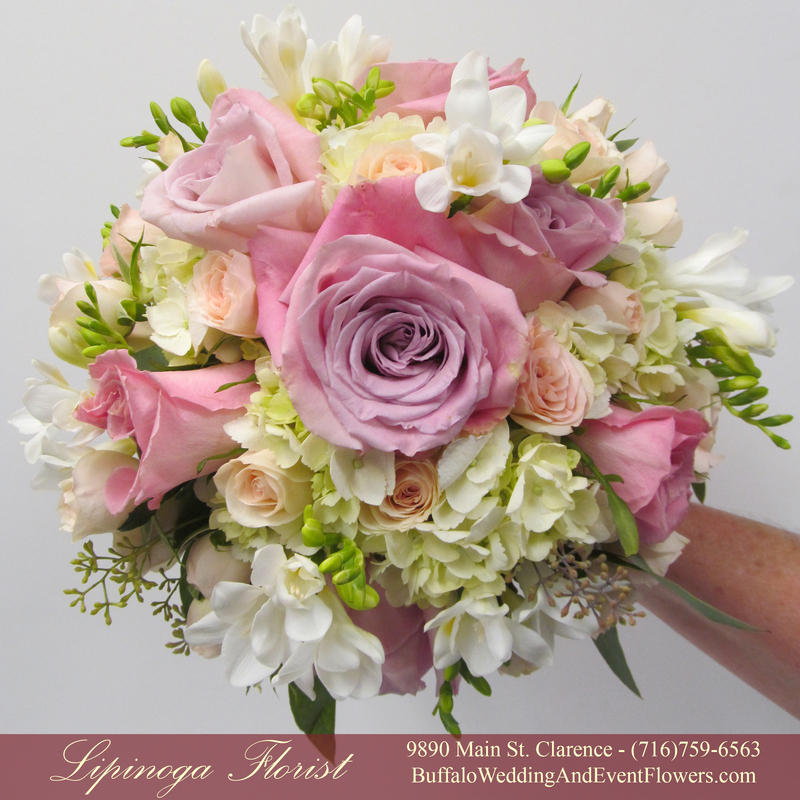 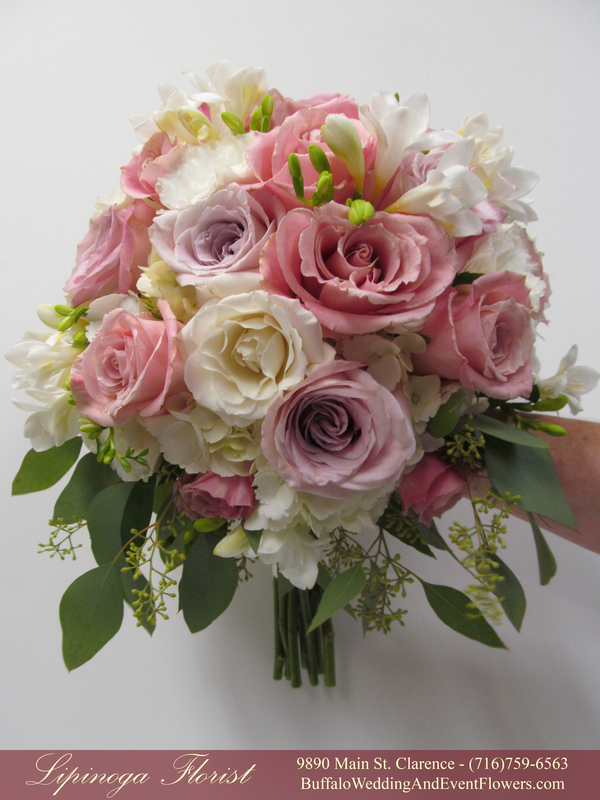 The bride carried a beautiful bouquet of pink and white roses accented by stephanotis with Tiffany blue crystals. 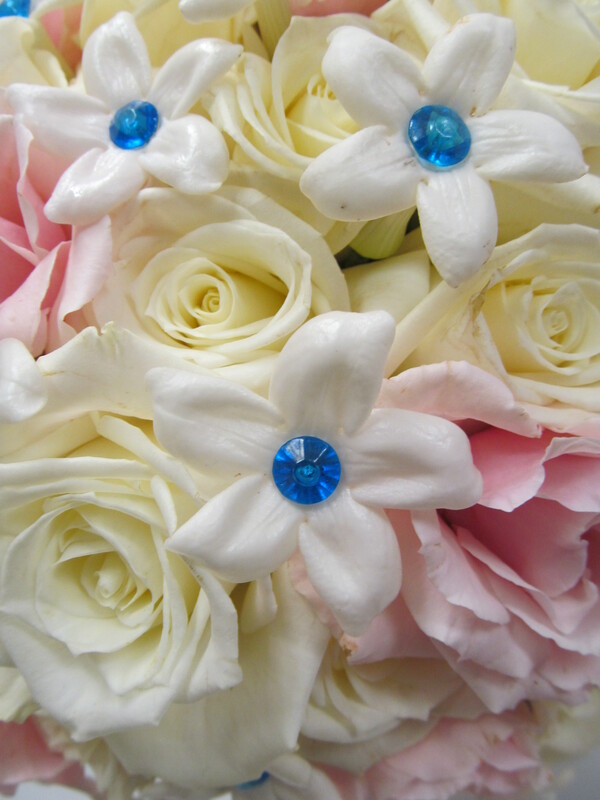 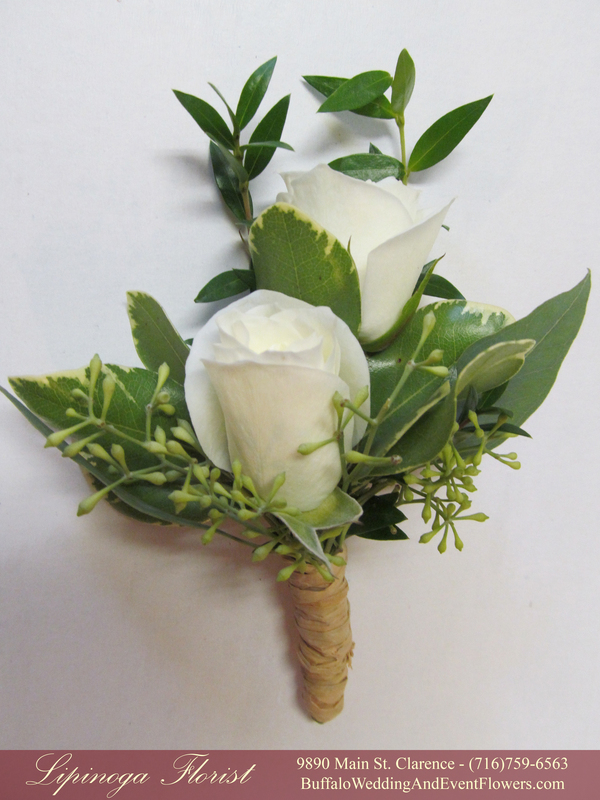 The groom wore a rose complemented by stephanotis with crystal centers to coordinate with the bride. 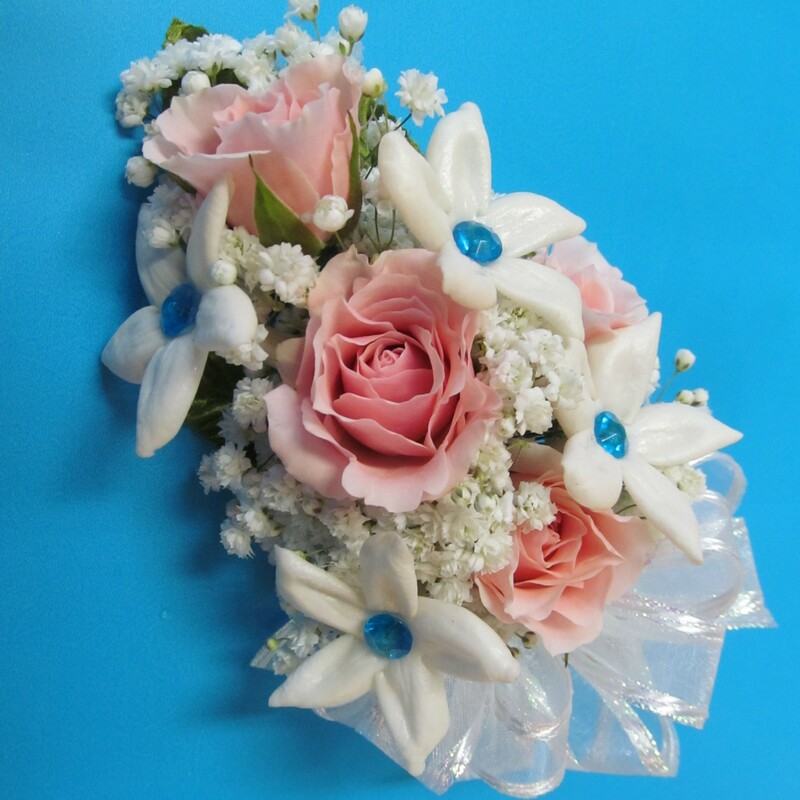 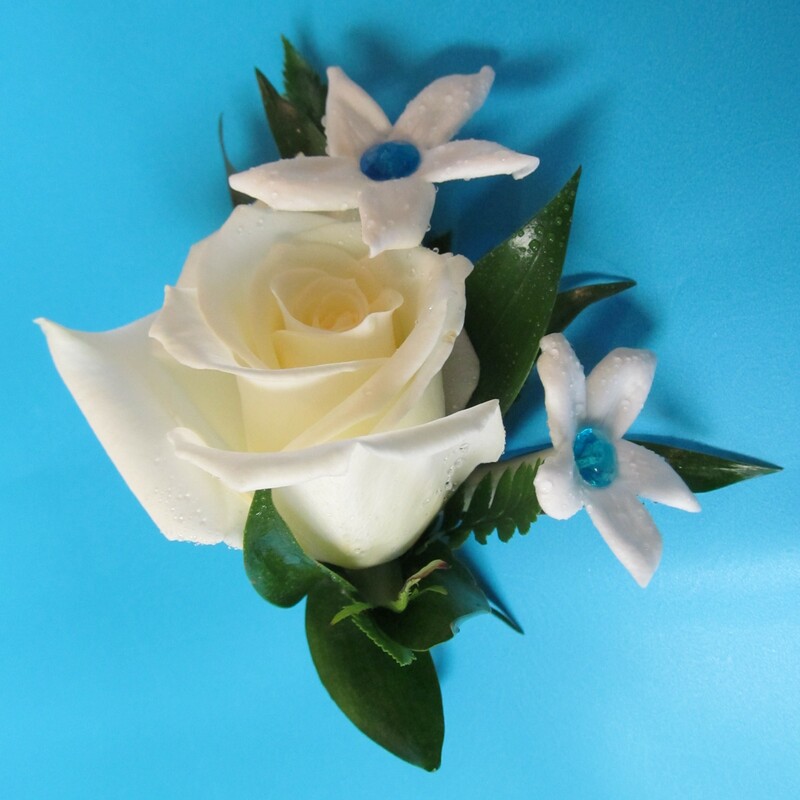 The mothers corsages were made to complement the Bride’s bouquet. 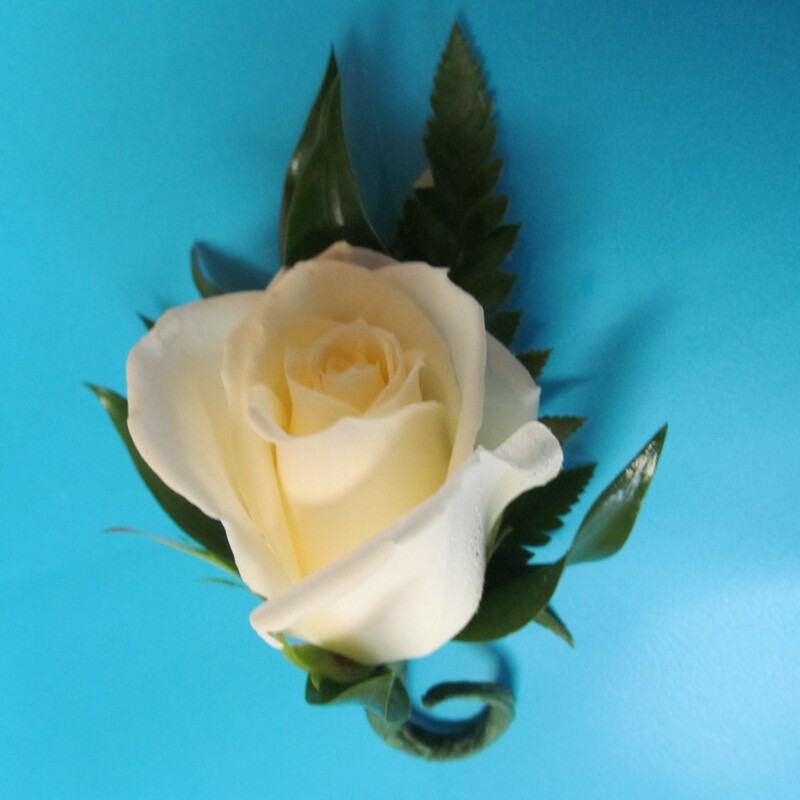 The fathers wore simple rose boutonniere. 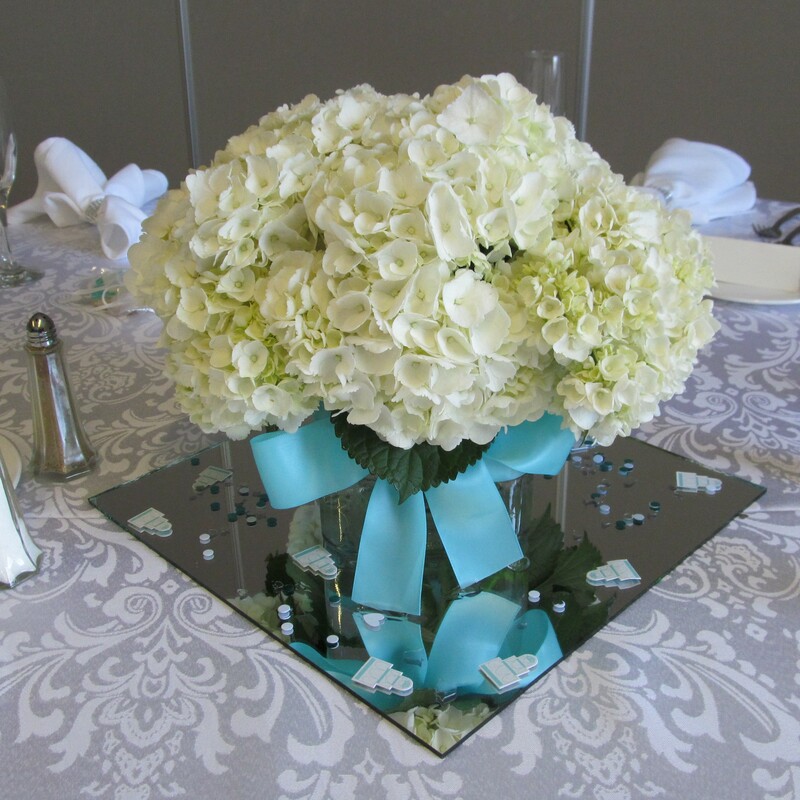 Centerpieces of fluffy white hydrangea were tied with a Tiffany blue ribbon. 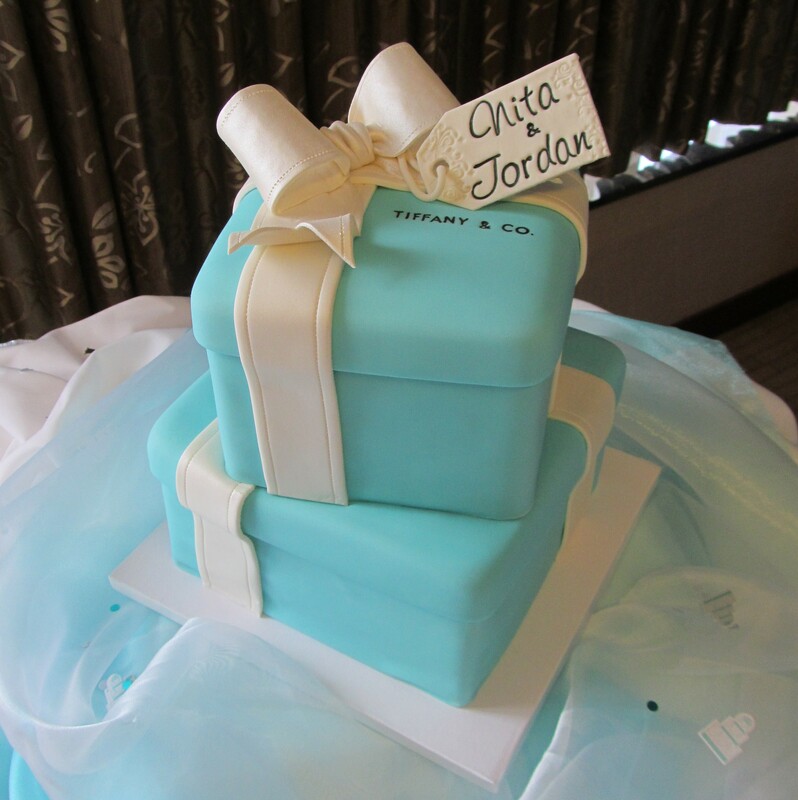 A cake of stacked “Tiffany” boxes followed through on the theme. 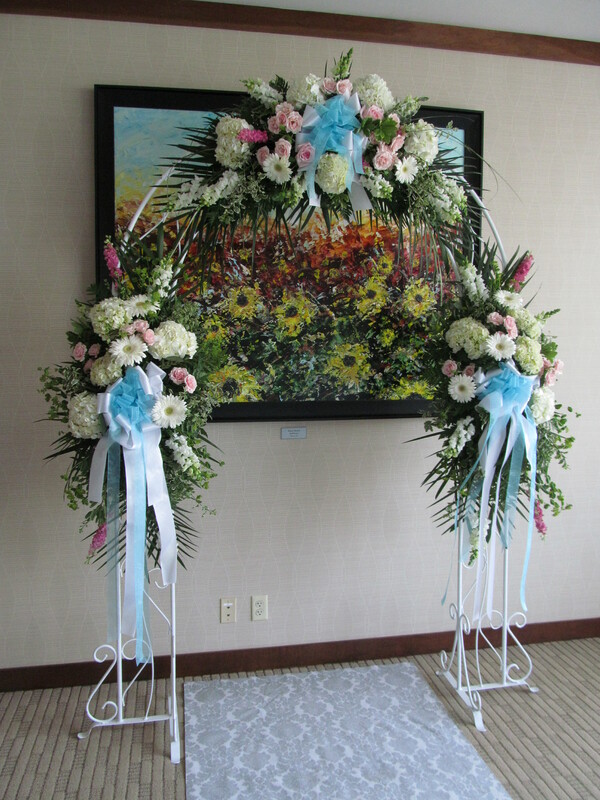 The bride and groom joined hands in front of an arch of pink and white flowers accented by blue ribbons. 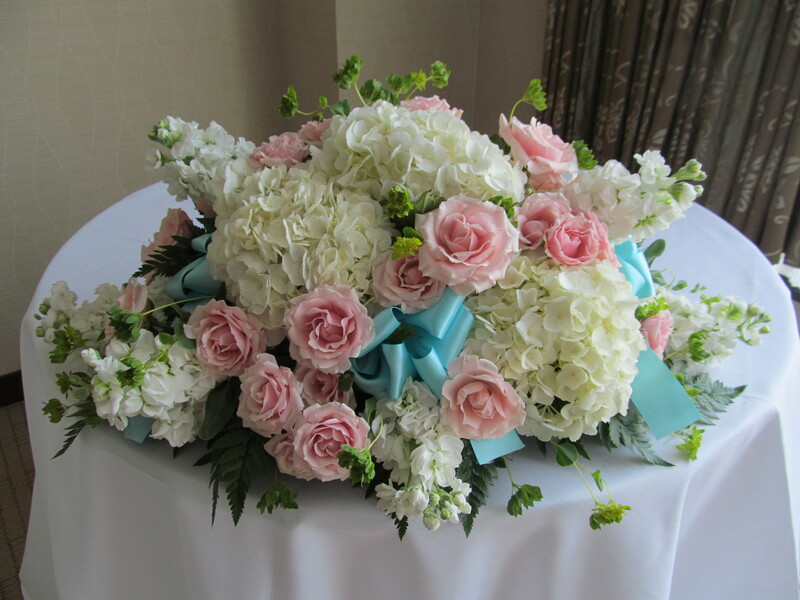 A long and low centerpiece of hydrangea, pink roses, and stock was accented with the same touch of Tiffany blue. 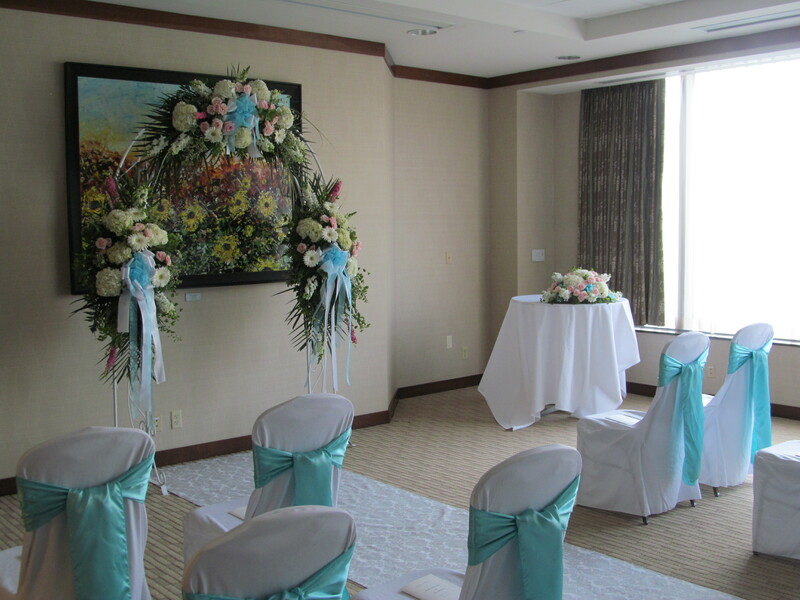 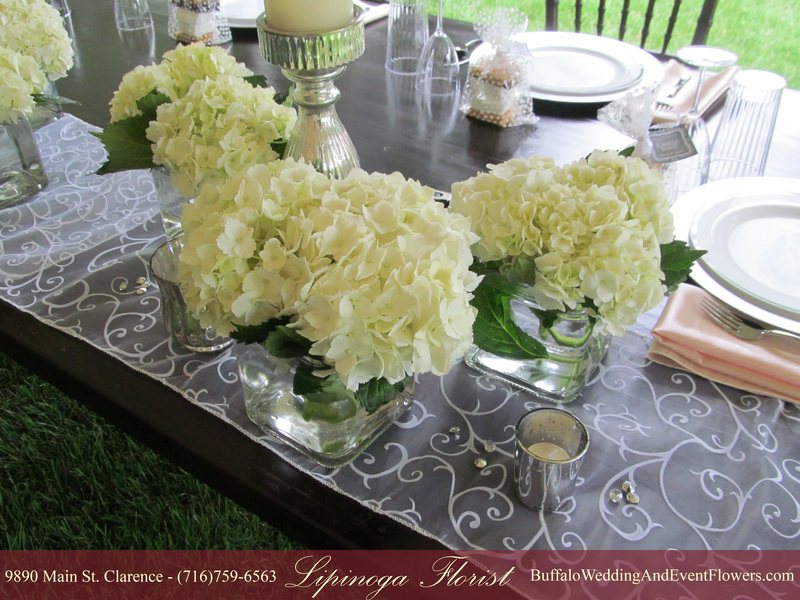 Both the ceremony and reception were held at the Embassy Suites in Downtown Buffalo, NY with floral arrangements designed and created by Lipinoga Florist.